Arriving to our hotel on beautiful St. Thomas in the US Virgin Islands is easy and convenient, thanks to many direct flights available. Click here to see a map of St. Thomas and see the route the Taxi will take you from the airport to Bolongo Bay. And, since we’re the US Virgin Islands, no passport is required for US citizens to travel to our Caribbean paradise. 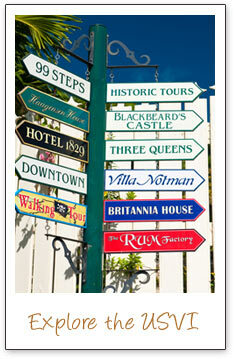 Our US Virgin Islands hotel is located on the south side of St. Thomas. To arrive here, you can take a taxi or rent a car – just remember that we drive on the left! A taxi from the Cyril E. King International Airport (STT) to Bolongo Bay Beach Resort typically costs $12 for a single person, and $9 per person for two or more people. Please note there is also a charge of $2 to $4 for suitcases, depending on size. The airport taxis are multi-destination vans, which means you will share the ride with other visitors who may be going to different destinations on the island. From the airport, turn right onto the main road, Route 30 East. Stay on this road through downtown Charlotte Amalie, driving alongside the waterfront, past Havensight, one of our cruise ship docks and shopping center. Veer left when you see a sign for Havana Blue ahead. Another mile or so down the road, you will go down our famous “Donkey Hill.” Just a short distance after, you will see signs for Iggies Beach Bar on your right. Keep driving along the white wall and you will see the entrance for Bolongo Bay Beach Resort.